Autumn warmth in Alaska brought back ‘the blob.’ That could mean a wild winter in the Lower 48. Throughout early fall, Alaska has been oddly warm and pleasant. The cause of the freakishly nice weather has been a massive high pressure anchored over and around the state. One of the strongest on record for fall, this sprawling dome of warm air has helped keep the usual transition to cold stunted. Since days are still long in early fall across Alaska, the sunny September (and into October) skies have also allowed ocean temperatures in the Northeast Pacific to rise significantly as well. This has led to a return pool of abnormally warm ocean water in the Northeast Pacific known as "the blob," and just in time for Halloween! When the blob is in place, the jet stream, which both divides warm and cold air and acts a super highway for storms, tends to veer north over top the blob. This results in a big ridge of high pressure forming over the western North America, which brings mild weather and blocks storms. The blob’s presence was linked to the persistence and intensity of the drought in California from 2013 to 2015. It also ″was blamed for contributing to 2015 being the hottest year on record in Seattle," according to Scott Sistek, a meteorologist with KOMO in Seattle. 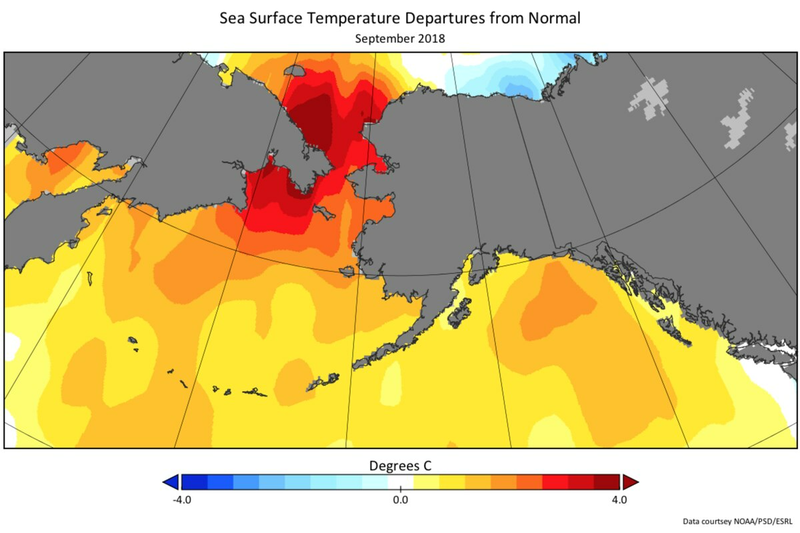 Following Alaska's stunningly sunny September, warmer than normal conditions have persisted into October, despite some change in the pattern, which is now delivering more in the way of clouds and precipitation. While the National Weather Service Climate Prediction Center is forecasting warmer than normal conditions for Alaska the rest of the month, the mega-high pressure zone feeding the blob is expected to continue to shift and break down a bit. In its wake, a stormier pattern may take over, at least for a time. This would allow the waters where the blob currently resides to begin to mix better, perhaps ultimately diminishing or even destroying it. "How long will BLOB Jr. last? At least as long as we have persistent high pressure over the north Pacific," wrote Cliff Mass, a professor of atmospheric science at the University of Washington, in a blog post. "As this point, it looks like things are evolving to a pattern with less high pressure offshore, so the BLOB should weaken." According to Brian Brettscheider, a climatologist in Alaska, even if high pressure persists, it may turn into a source of cold air rather than warmth given Alaska's waning sunlight - which would weaken the blob. Ultimately, it's hard to say much conclusively about the blob's fate. The blob last showed up around this time in 2016. Back then, there was some thinking that it may lead to a new round of winter cold outbreaks in the East. That didn't really happen, as the blob dissipated. Blob or not, the damage has been done in Alaska, where drought persists in the coastal rainforest of the southeast, and it's been an extraordinarily peculiar start to the cold season. "The onset of autumn in Alaska - the wettest part of the year for south-central and southeast Alaska - has been slow to arrive by 4 weeks or so," said Dave Snider of the National Weather Service forecast office in Anchorage. Anchorage has yet to witness a freeze. Although the city could see its first freeze in about a week, that will be roughly 10 days to two weeks past the old record for latest, a substantial gap. "Nome should have 20 freezes by now. This year just one," Brettschneider said. "Anchorage should have 20 days with temperatures below 38 degrees. This year zero. So it's not just the lack of a freeze, it's that everything about the air mass is exceptional and persistent."